Reinvent your desktop workspace with the ultra-compact HP Desk Dock, which quickly charges your HP Elite x3 and uses its pocket-sized PC power to maximize your Windows 10 Mobile productivity on an external display, keyboard, and mouse. 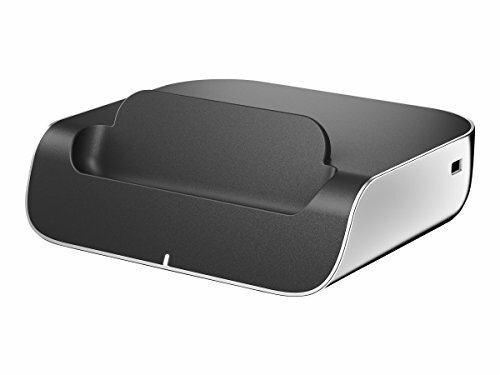 Connect to a wired network through the HP Desk Dock's Gigabit Ethernet connection and your choice of input/output devices and accessories with two USB-A ports and one USB-C port. Get back to full battery power while you work when you quick charge your HP Elite 3x in the HP Desk Dock. Simplify your day with one device. The HP Desk Dock lets you use your HP Elite x3 in and out of the office and easily dock at work and home for a complete desktop experience. Use the security lock slot and your own lock (sold separately) to secure your dock to another device, desk, or table.